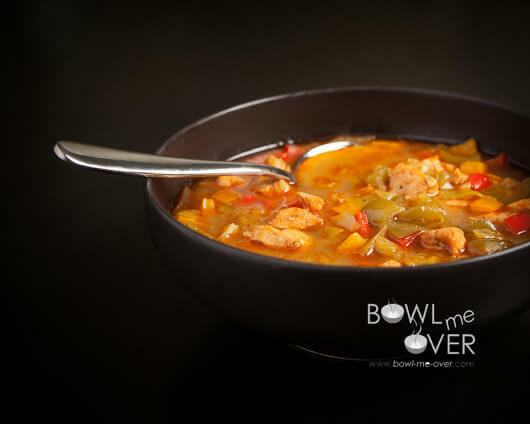 Tri-Pepper Chicken Stew - big flavor as it simmers on the stove. 7-8 tomatillos about 3/4 lb. Measure the spices into a one gallon ziplock bag and mix them together well. Chop the chicken into small bite sized pieces. When complete add them to the ziplock spice bag, seal it and massage the spices into the chicken making sure they are well coated. Set aside. Now it’s time to chop the vegetables, the tomatillos, red, green and orange peppers and the onion. Be sure to cut them into small bite sized pieces. Heat the olive oil over medium heat in a large stock pot. When the oil is hot, add all of the vegetables and stir fry for about 5 minutes until the vegetables just begin to soften. Remove the vegetables from the pot and place them into a large bowl. Next add the chicken and spice mixture into the stock pot (you may need an additional tablespoon of oil). Brown the chicken on all sides, about 2 minutes per side. Depending on the size of your stock pot, you may need to do this in a couple of batches. When the chicken is browned, add the vegetables back to the pot and stir well. Add the chicken broth and increase the temperature to high, stir everything together really well. Bring the pot to a boil, scraping up all of the little brown bits on the bottom of the pan, all those little bits mean big flavor! After the soup comes to a boil, reduce it to a simmer and cover loosely. Stir the soup occasionally and continue to simmer for 30-45 minutes. Wa-la! 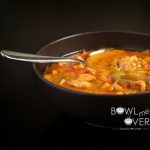 Perfectly flavored delicious soup! This just looks so good for a nice stew to enjoy on a cool evening. Love it. Ive made it several times and just so tasty Yum!!! That’s wonderful, I’m so glad you are enjoying it!